This is a how I clean and sanitise my corny kegs using cleaning product readily available in the shops. I am sure there are many way of doing this so if you do it differently feel free to post. 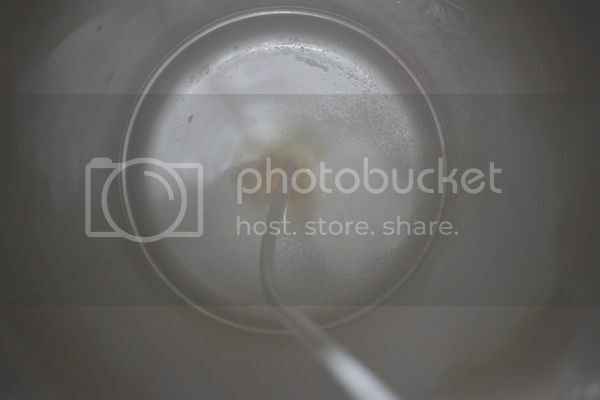 So, for starters, one empty corny keg (excuse the background mess). Having removed the lid this is what I am left with inside. After a quick rinse with hot or cold water I find most of the crud comes out easily. The lid has however stayed on since the keg emptied therefore it has not been able to dry out. You may just about be able to see I have added three scoops of oxy clean to the corny. I then fill the corny keg with hot water. 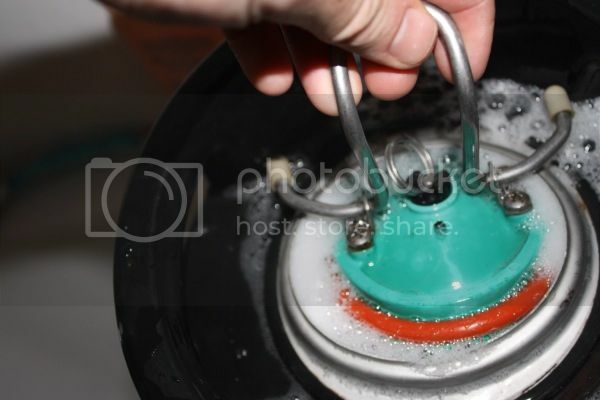 The oxy cleaner will foam, I stop filling when it reaches the mouth of the keg. 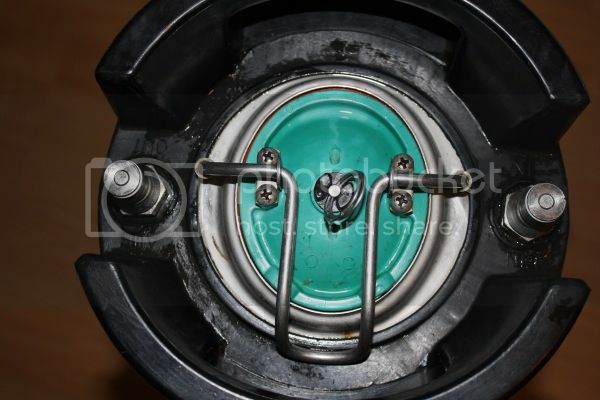 The cleaner should then be in cotact with all of the inside of the keg. I dip the lid in the foam as I fit it. The keg then gets a good shake. 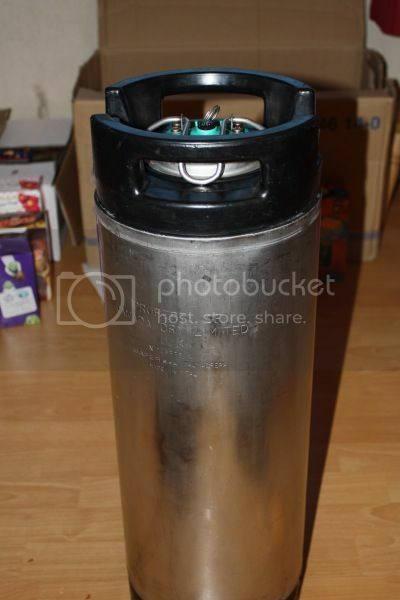 The oxy cleaner will release oxygen and pressurise the keg (along with the steam from the hot water). To ensure the cleaner has reached inside both of the dip tubes i find a suitable implement close by (a screwdriver in this instance) to gently push down on the poppet of each post. Make sure you cover the post with a pot or something (and certainly don't put you face over it) as it will squirt hot oxy cleaner quite powerfully, I found out the hard way . You could attach the correct disconnect here, as a safer way of doing it. 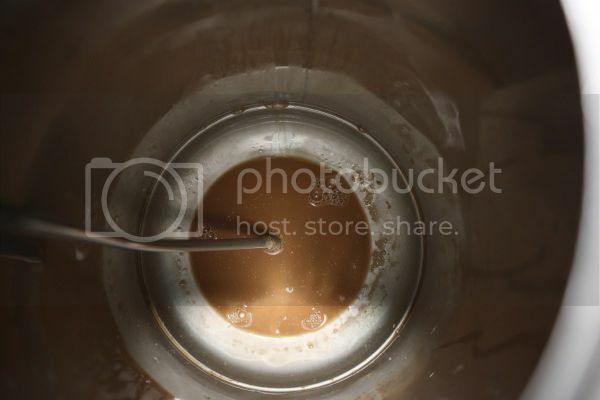 After 20 mins or so I empty the keg (this can be reused to clean a dirty fv or another keg). 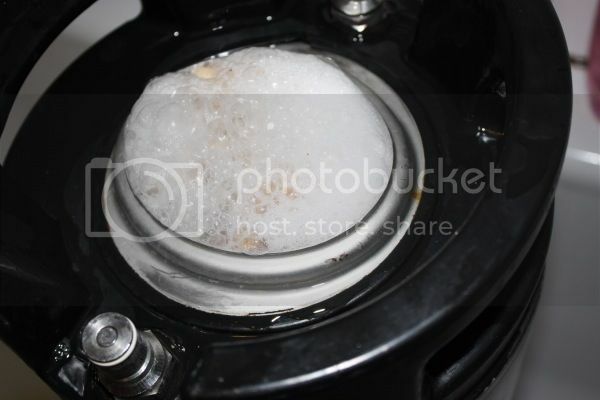 I then put some boiling water in it, give it a shake, depress poppets to ensure there is no cleaner left in the keg. 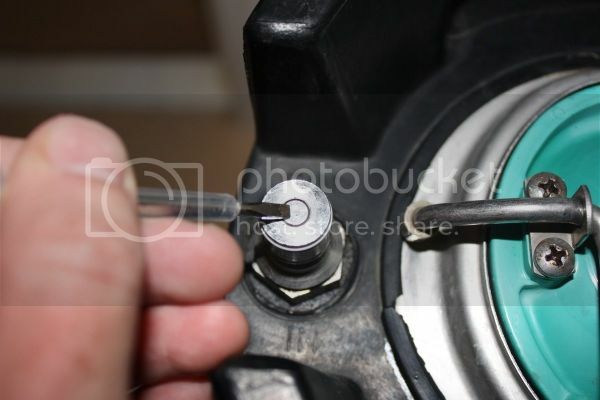 I repeat this process with some Videne to sanitise (but use a little gas to force it up the out dip tube). I put some of this into a spray bottle to use on things like the corny lid etc. Then my keg is ready to be filled again. If I am not filling straight away I store it with a little CO2 in it. You now have a sanitised, CO2-filled keg ready to rack your next batch into without oxygen pickup, and you've also cleaned and sanitised your beer line + tap! Good how to! My regime is very similar to the OP, though I sanitise (in my case with starsan) just before use rather than directly after cleaning. If theres no CO2 handy, for the sanitising solution stage I use a couple of old disconnects with 6" bits of tube on. Blowing down the gas in tube will squirt starsan up the product dip tube and post, then tipping the corny up will drain some through the gas disconnect, then I shake the corny about for a bit before emptying it out (in that order, so that I'm not blowing into anything after its been sanitised). I've been adding a bit of calgon powder to my mix for a while now, to prevent that, but I don't actually know how well it works since I also try not to leave it too long. There is a layer of sediment on the bottom of the corny afterwards though (which can be a bit stubborn), possibly that is the deposit being made to drop out through chelation but sadly I lack the chemistry background to know. Kev888 wrote: Good how to! My regime is very similar to the OP, though I sanitise (in my case with starsan) just before use rather than directly after cleaning. Thanks for your comments Kev, I probably should have said i sanitise at cleaning and again before use if not using straight away. I have just fallen at the very first hurdle with my first ever Corny cleaning experience as I cannot get my Corny anywhere near the hot tap to get the oxi-clean going! Hose attachments on their hot taps or wash them in the bath/shower? Just use cold water out of the outside tap? Or does everyone else have a dedicated Corny cleaning facility with catering sized sinks?! Last edited by Maysie on Wed Aug 19, 2015 17:20, edited 1 time in total. in the bath with the shower hose works, But lay a dirty towel in the bath first otherwise you will spend ages cleaning off the rubber marks from corny base..
A bit more complicated, but I built a pumped system for cleaning out my cornies (I think I put a build thread on the "other place") which uses a plastic tub full of sanitiser, a pump and some keg fittings. 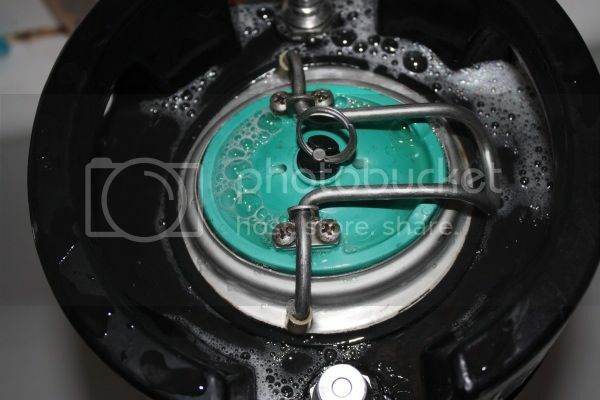 Firstly I swill the keg out with water and give a visual check to make sure there's no deposits or scum (clean with a scrubber if there are) and then connect the outlet of the pump to the oulet post of the keg, put the keg upside down over the box of sanitiser and switch on the pump to backflush sanitiser up the spear, which then sprays round inside the keg and runs down the inside of the keg walls. The lids get hoyed in the box for good measure. I now use crusader kegs but similar cleaning method. I put them in the bath and fill with hot water using a jug. I have a fancy 'tapless' bath that fills through the overflow outlet, so I cant use the bath. Our shower has a temperature control limit on it, so really wont be hot enough. 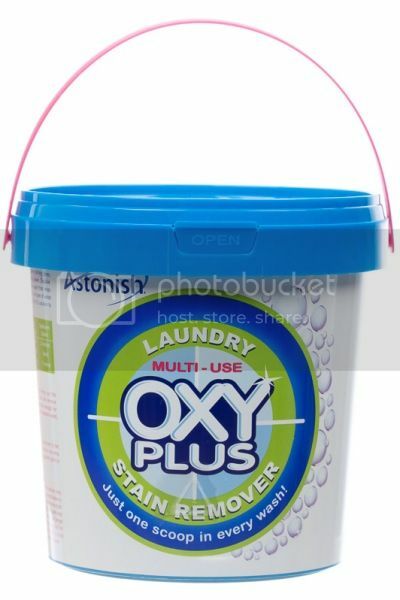 imho dont bother faffing about with connectors and hoses if simply popping the lid to pour kettles n jugs of hot water in..
if using laundry oxi to clean, add a scoop after filling with 10-11l of warm water and quickly lid up, the effervescence of the laudry oxi and its 02 release will pressurise the keg. give it a shake and depress the out post poppet with a tspoon so it fills the out dip tube with cleaner, and let it sit for 10-15 mins, up turn for a further 10 mins or so..
then squirt cleaner thru the in and out posts with a tspoon, and perhaps the prv too..
to rinse and sanitise do similar things, tho you may need some co2 to seal the kegs.. When soaking with oxi, I just fill to slightly over half way, saving water. Just invert the corny (lid on!) half way through the soak, giving it a good shake first to build some pressure. As long as it's just over half filled, it will all get a soaking. My forearms are puny enough for me to get through and down to the bottom with a cloth! Bricklayers may struggle. GrahamT wrote: My forearms are puny enough for me to get through and down to the bottom with a cloth! Bricklayers may struggle. Lucky you! I couldn't get past about 50-60% of the way down, had to use a 2' length of pipe with a scrubby on the end to clean all they way down to the base. 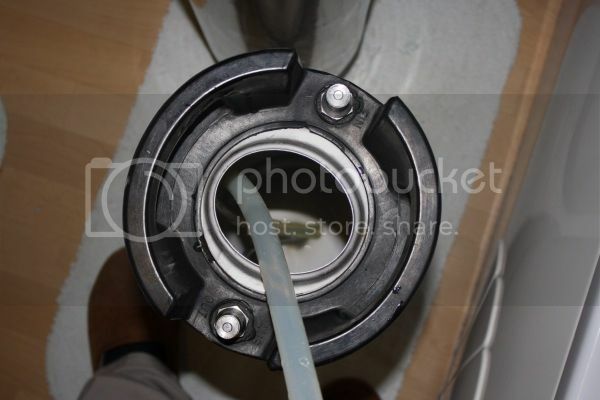 Similar issues with my Boots Alu keg as well. Lid is just TOO narrow. I work on a farm and can "just" get my arm in, although I ended up with a corni stuck on my arm once and looked a right div!! Hence the move to a clean-in-place system! I think the scale that forms is calcium oxalate. I've had it happen to me a couple of times and had to resort to citric acid solution to remove it. I use beer line cleaner to clean my kegs. 30 minutes cold soak and then thoroughly rinse. Sanitise with either Starsan or peracetic acid. Though I have never had an issue, I am going off Starsan due to something posted on another forum about it not being very effective against yeast and moulds. I need to find out a bit more about this.